Compiled from research and real-world experimentation, these are my recommended starting points for selecting an "external" gear ratio for bicycles with internally geared hubs (and single speed hubs) with "28 inch" / 700C / ETRTO 622 size wheels for use in a paved urban environment with a moderate number of hills and traffic lights. 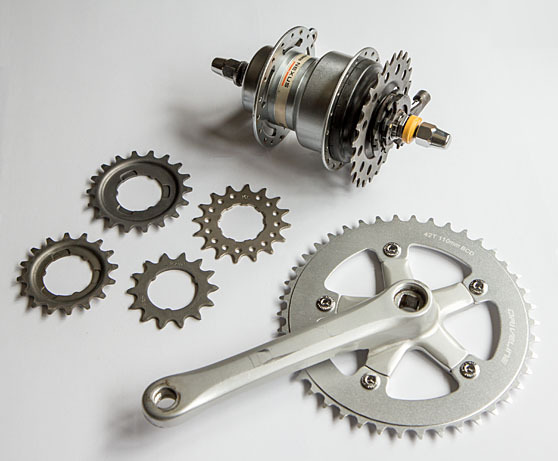 If a desired ratio cannot be achieved by changing the cheaper rear sprocket/cog, the front chainwheel or integrated crankset can also be changed. What matters is the final ratio, which can be approximated with multiple combinations of tooth counts front and rear. With that said, the preference should be a combination that avoids the smallest rear sprockets (<16T). Larger sprockets reduce wear on the chain and sprocket and provides a slightly more efficient drive train. Note: Many three speed city/utility bikes are from the factory set up with a subjectively too high ratio of 38/16 which makes the top gear too heavy for normal, non-tailwind cruising on level road. 38/17 is better in my opinion. Please note: Tire width affects tire height and therefore wheel circumference, so it might be necessary to compensate a little if you have very low profile narrow tires or very big balloon tires. Most of my ratio experiments were done with 25-35 mm tire widths.